Every organization is in search of Opportunity but sometimes you have an opportunity in front of you and you miss it. Opportunity will never knock your door and say i am here you need to search opportunity every time. 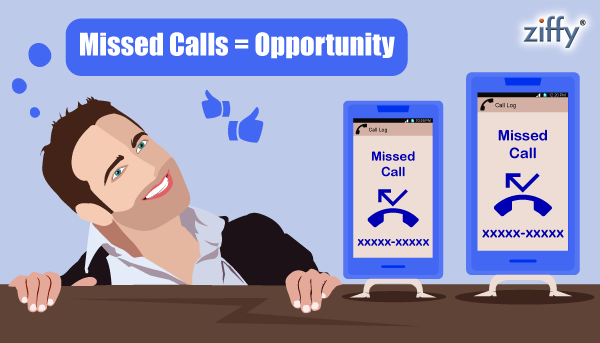 Missed call is one way to search opportunity. Missed Call Service has become an effective way to engage and involve customers by any brand/business. The missed call service is targeted and a cost effective means for businesses to reach out to its target audience. The target audience could be in regions where Internet penetration is low or when you want to give a call to action to an online customer who needs to engage with you offline. Missed calls are a grand way to keep them happy and offer your services, at the same time. Miss calls service is unique service to get leads from the client.The missed call number is 24×7 activated so customer if calls at late night or early morning you will never missed them. Missed Call service is a completely automated web based application enables you to get the real time notifications of all calls on your dedicated Mobile/Land Phone/Toll Free Number. Lead Capture – Marketers who advertise across mediums still find a challenge to judge ROI’s. Missed calls help to capture 100% of the leads coming from across different mediums which allow businesses to make strategic and cost effective decisions. Feedbacks- Businesses can get real time feedback on customer experience on service/product and if required. Content on Demand – Bring content on demand to users on information like help material, new offers, new products etc. Missed call services are key players in integrating customer database along with a variety of utilities including opt in & opt out services, survey polls and many more. This feature provides smart data collection from customers with ease of use as the customers carry no cost of the enrollment process. The prominent utility of missed call service is the speedy acquisition of customer details with a fully automated new age mechanism.